Conversation pattern. The border, the rim and the foot have been enameled overglaze in ochre. Both the printed border pattern and the ochre bands are quite similar to another loving cup, named I Worrall and dated 1790 also included in the exhibit. The opposite side of the cup with cameos of "His Royal Highnefs Prince of Wales" and the "Honourable Willm. Pitt" along with floral sprigs. 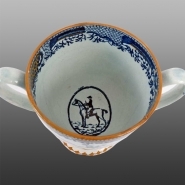 The interior of the cup revealing the Jocky Up pattern printed in an oval in the bottom. 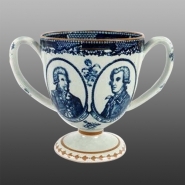 A pearlware loving cup printed in blue underglaze with cameo portraits of "Queen Charlotte" and "George the III" on one side and "His Royal Highnefs Prince of Wales" and the "Honourable Willm. Pitt" on the other. Thistle and rose sprigs, symbols of Scottland and England, are added decoration and additional sprig designs are printed on the handles. The border of geometric motifs with oriental symbols printed on both the interior and exterior is the same border design used with the well-known Conversation pattern. The border, the rim and the foot have been enameled overglaze in ochre. Both the printed border pattern and the ochre bands are quite similar to another loving cup, named I Worrall and dated 1790 also included in the exhibit.